On March 16, 2019, at the Finger Lakes Regional, HF-L’s Robotics Team, CougarTech placed eighth in the qualifying rounds out of 49 teams and earned the Innovation in Controls Award. The Innovation in Controls awards “was truly a full technical team effort” said Gary Stottler. It required the electrical, mechanical/CAD and programming teams to come together and truly create something new. The entire team is especially proud of Ellie Fairchild for becoming a Dean’s List finalist at the event. She will go on to compete at Worlds in Detroit in April. 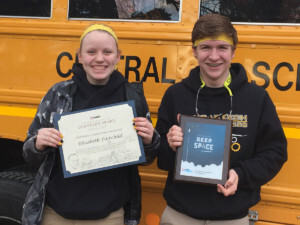 Both Ellie Fairchild (Mechanical Lead) and Zack Farnam (Technical Director) were nominated for the award based on leadership, technical expertise, entrepreneurship and STEM awareness and outreach. “Ellie’s work with younger youth in the district really put her over the top,” said Bonnie Coddington, a senior mentor for the team. CougarTech competed in their final regional in Cleveland on March 29th & 30th.